Want poppadoms with your powder? SnowSphere speaks to Peter Robinson, founder of Ski Himalaya, about his new ski operation in Gulmarg, Kashmir, part of the Indian Himalayas. Of all places on Earth, India is one of the last that people associate with snow. How did you end up setting up a ski operation there? In the late 1980s I read about plans to put in a gondola at Gulmarg. It seemed that once the gondola was complete Gulmarg would be a fantastic place to visit before the rest of the world woke up to its existence. My brother Justin visited Kashmir in 1994 and at that time there were certainly major questions over whether the gondola would ever be built. A few years later I read that the first stage of the gondola (to 3150 metres above sea level) had finally opened. With another brother (Phil) I arrived at Gulmarg in January 1999 in the midst a huge snowstorm. After continuous heavy snowfalls, during which there was little to do except eat, sleep and drink rich Kashmiri tea, we woke on our fourth morning to the surprise of brilliant blue skies. I stepped outside to find Mt Apharwat’s five-kilometre-wide untouched powder terrain towering above me and could not help thinking of Brigham Young’s description on seeing Utah’s Salt Lake Valley: “This is the place”. It was a long wait from 1999 until the top stage of the gondola (to 3980 metres above sea level) finally opened for year-round operation in May 2005 and we simultaneously went live with the Ski Himalaya website. What exactly does Ski Himalaya do? Firstly, we are a marketing agent for Gulmarg’s leading hotels. The three hotels we offer were the only hotels last winter to combine a convenient location near the lifts with western accommodation standards. Secondly, together with a long standing friend, Bashir Ahmad, we offer guiding and local transport services “Kashmir Powdercats”. What kinds of problems did you face when trying to start your business? Communications from overseas can be very difficult at times for a variety of reasons. Thankfully mobile phones became available in Kashmir in 2005 and Bashir and I can now contact each other on a fairly reliable basis. Our biggest single problem in marketing for our first season was delay in confirmation by the resort of earlier plans to recruit an internationally qualified ski patrol and avalanche control team. 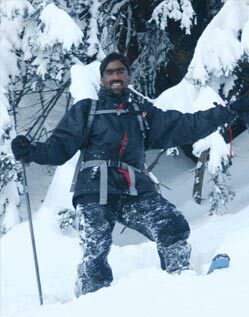 It wasn’t until a couple of months before last winter that I found myself scrambling to assist Ido Neiger, another Gulmarg regular, find suitably qualified western patrollers. Of course without experienced patrollers there was no way of knowing for sure if skiers and snowboarders would actually be permitted - with their equipment - to ride the new gondola! All ended well with six professionals from Canada, the USA, Australia and Sweden volunteering their services to enable safe winter operation of Gulmarg’s gondola and provide training for the local Kashmiri patrollers. You’ve just had your first season of operations, how did it go? We hosted 60 guests from 10 different countries. Almost everyone expressed a desire to return, with a number already rebooking for next winter. Snowfalls in 2006 in Kashmir were less than stellar, but with gondola crowds peaking at about 50 riders on the busiest days, plenty of nice turns were had by everyone. The most pleasing aspect of our first season for me was the excellent team of people Bashir put together for our guiding and local transport operation. The guides are all locals who have grown up in the shadow of Mt Apharwat. Our drivers are again locals, all with many years of experience in driving the mountain road from Tangmarg to Gulmarg. India has a potentially huge market for snow sports. How popular are skiing and snowboarding right now with the locals? Most sunny weekends in winter see a throng of enthusiastic beginners through to more advanced local riders and spectators enjoying Gulmarg’s poma slopes. There are also a small number of skiers visiting from elsewhere in India including a few who venture onto the gondola terrain. 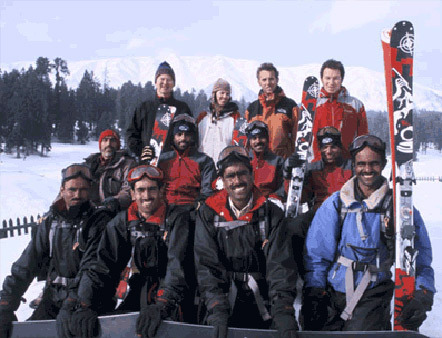 Skiers dominate, though snowboards are now available for hire at Gulmarg. Winter activity reaches a high-point during government sponsored learn-to-ski weeks for school groups from Kashmir and other parts of India. Their ski instructors include locals who earned their qualifications in the late 1980s at Val D’Isere and Chamonix. What are the facilities over there like, with regards to the lift system, transport links, shops and restaurants? Visitors should certainly not expect a lift-system similar to Whistler or Tignes or nightlife to match St Anton and Verbier. What Gulmarg does have is a massive mountain served by a single 1330 vertical metre gondola – that’s more vertical than any resort in the USA - designed by Poma of France. The enclosed gondola-pods each carry up to six passengers. Day-to-day operation of the gondola is dictated by weather and safety considerations. On snowy days when the upper gondola is closed our guests can either ride the intermediate terrain of the lower gondola or join our guides in exploring the superb forest terrain which descends from Gulmarg to the valley floor. Gulmarg has two Kassbohrer snow-groomers with a new Leitner snow-groomer on order for winter 2006-2007. 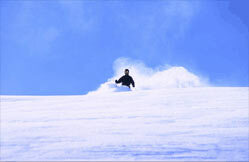 At the end of February 2006 Gulmarg sponsored a visit by one of Whistler’s leading snow-groomer professionals. Chris’ training of Gulmarg’s Kassbohrer drivers will hopefully lead to more expansive and improved snow-grooming in future winters. Srinagar is a one hour 20 minute flight from Delhi. Gulmarg is 56 kilometres from Srinagar. There are no direct public transport links between Srinagar and Gulmarg and we meet all of our guests at Srinagar Airport. The airport’s runway lighting is currently being upgraded to the highest classification level within the international airline industry which will make landings possible in all weather conditions. We do not recommend Gulmarg as a self-catering holiday destination. Food outlets outside the hotel restaurants are limited, with a convenient exception for lunch being the restaurant at the gondola’s mid-station. Gulmarg has no permanent population – even the families of hotel staff live in nearby towns. Shoppers keen to buy Kashmiri textiles (from pashminas to carpets) and handicrafts (from jewellery and woodwork to papier mache ornaments) will find a much wider range of goods in Srinagar city than in Gulmarg. As global warming ever threatens the decline of the ski industry, do you think higher resorts like those in the Himalayas will start attracting more western tourists? I’m more inclined to think that an increasing number of western tourists will be attracted by a search for a less crowded and more traditional mountain experience. The snow quality is an added bonus. What kind of reception have you and the business received from the locals? Extremely positive without a doubt. Do you speak the local lingo of Kashmiri? Not fluently. Kashmiri is the main language, but most locals are also fluent to one degree or another in English, Hindi and Urdu. As an idea of how widely English is spoken, Kashmir has at least four of its own daily English newspapers, in addition to a number of national English dailies which are also circulated in Kashmir. You’re based in the Kashmir region. Have you encountered any trouble with regards to the political unrest there? None whatsoever. However this is clearly an important consideration for all visitors. Our observations are set out in detail on the Q&A page of our website. What kind of clientele does Ski Himalaya attract? 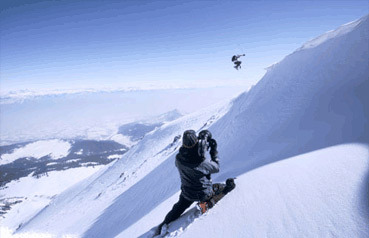 Mainly experienced to very-experienced skiers, telemarkers and boarders. We hope over time to introduce an increasing number of advanced-intermediate riders to the powder snow experience on offer at Gulmarg. We also hope to continue to attract a very internationally diverse guest base. What does skiing in India offer that can’t be found elsewhere in the world? Uncrowded and untouched slopes similar to the experience of heli-skiing for the price of a gondola ticket. Are you based in India year round? What do you do during the summer months? Last winter I was on the ground for six weeks in Kashmir and am visiting again over the summer. Most of the year I work in a consulting firm based in Sydney’s CBD. I devote one day each week in Sydney to Kashmir. Ski Himalaya’s long term business model is very much focussed on empowering Kashmiri locals to manage our winter operations in Kashmir, with myself attending to marketing and planning over the internet. Are there any Indian ski or snowboard brands, or any sponsored Indian skiers or snowboarders? Currently no to both questions - we welcome sponsorship for our guides. What’s the best thing about living, working, and skiing the Himalayas? Making a difference and a positive contribution within the local community. That may sound corny to some readers but it is undoubtedly a great feeling. I definitely get more powder days in Kashmir than back home in Australia! Also, Gulmarg’s untouched beauty and ambience are matched by few ski resorts anywhere in the world. Where else have you skied in the world and where is your favourite place? I learned to ski in Australia’s Snowy Mountains. During my 20s I skied in Europe, USA, Canada, South America and Japan. Places I especially love are Argentiere in France, Austria’s Arlberg region and Alta in the USA. Are there any plans for extending the ski areas, or building new ones? I understand that a member of the Ford family recently presented a serious submission for the development of an entirely new ski resort in Himachal Pradesh. Unfortunately for snow enthusiasts, objections from members of the local community resulted in abandonment of the project. I expect it will be some time before lift infrastructure on a scale comparable to the gondola at Gulmarg will be replicated elsewhere in the Himalayas. Is Gulmarg the only ski resort in India? There are at least three others: Solang Nullah and Narkanda in Himachal Pradesh and Auli in Uttaranchal. What’s the history of skiing in the Himalayas? I’m not sure about elsewhere in the Himalayas, but skiing has been a winter activity in Kashmir since British colonial days - well prior to World War Two. My wife Sally’s grandparents by coincidence visited Gulmarg during the war years from the RAF’s airbase in Peshawar where Sally’s grandfather was temporarily stationed as the resident doctor. 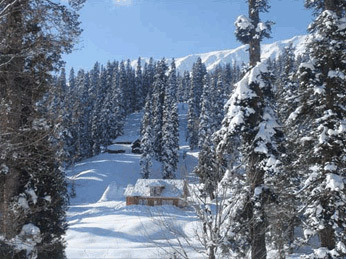 For many years Gulmarg was a popular summer and winter holiday destination for colonial administrators and army officers. A number chose to be buried at Gulmarg and in summer their crumbling headstones can still be found in Gulmarg’s British cemetary. Gulmarg’s history as a holiday retreat extends back to the 1500s when it was given its name by the ruler of Kashmir, Sultan Yusuf Khan. Gulmarg is Kashmiri for “meadow of flowers”. India has a surprising history of competitive ski-racing thanks to the country’s Institute of Skiing and Mountaineering, which is better known outside of India for its promotion of climbing in the Himalayas. Each year there are a number of alpine and cross-country races at state and national championship level. Ski Himalaya is an inspiring accomplishment. What advice would you give to others who are wanting to set up a snow related business in a foreign country? Spend time finding the right people to work with locally. It is a lot easier to do business when the local people recognise you as one of their own. Yes, but life regularly tempers the dream with healthy doses of reality! If you’d like to sample the Kashmiri powder and learn more about Peter’s Himalayan ski operation, including photos, videos, and pricing, check SkiHimalaya.com.